Tracey Welson-Rossman, CEO and founder of TechGirlz, started the volunteer-organized nonprofit with the hopes of combating this disparity in STEM while evoking a sense of excitement in middle school girls for the field of technology. According to their 2016–2017 annual report, since its inception eight years ago, TechGirlz has managed to impact almost 5,000 young women through project-based learning on topics such as coding in Python, designing mobile apps, learning UX, and robotics. As Welson-Rossman explains, TechGirlz decided to focus on middle-school-aged girls when she came across a research study that suggested that girls lose interest in tech starting around 11 years old. A similar study that was conducted by Microsoft in 2017 suggests the same. “We saw that there wasn’t a place for middle schools that was being worked,” says Welson-Rossman when discussing how 11- to 14-year-old girls were not being encouraged to pursue an interest in technology. With a small core team, TechGirlz relies on partnerships with organizations like the Free Library of Philadelphia, Comcast TechWomen and the Drexel University chapter of Society of Women Engineers (SWE). In the case of SWE, young college women have the opportunity to teach and mentor younger girls about tech while reinforcing what they are currently learning in the classroom. 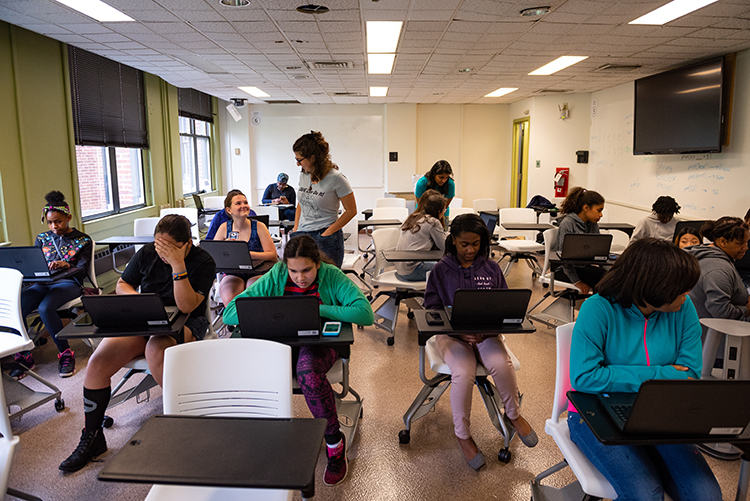 Recently, Jui Hanamshet, a 20-year-old second-year computer engineering student at Drexel and a SWE member, instructed about 15 middle school girls on how to code in Python in a small classroom on campus. Although Hanamshet, who has experience in both teaching and tutoring, was leading the Python TechShop for the first time, she had the assistance of a handful of other SWE members, including 19-year-old Elvira-Marie Mikhael, a second-year civil engineering major who has lead other TechShopz in the past. Hanamshet is in an interesting position. On one hand, she is helping to bridge the gender gap in tech by partnering with TechGirlz. On the other, she is navigating classrooms that still reflect this disparity. For Hanamshet, doing this work helps to ensure that once these middle school girls reach college and perhaps take up a major in STEM, that they do not feel isolated. Mikhael, who works on the SWE Outreach team, found that developing a relationship with TechGirlz was a seamless process. By partnering with organizations like Drexel’s SWE chapter, TechGirlz has been able to make a meaningful impact in not only the lives of thousands of young girls but their parents as well. TechGirlz is looking to branch out to other cities and replicate the impact that they have had on young women in Philadelphia. They set up shop in Chicago during the 2017–2018 school year. According to Welson-Rossman, by the end of the 2018 school year, it is projected that around 750 young women in the Windy City will have participated in a TechShop. TechGirlz is currently in the process of finding footing in the New York Metropolitan Area as well as Raleigh, North Carolina.